Today, I was scrolling down my twitter feed and saw that The Rise of Tomb Raider Collector's Edition was released. Now this brings up an important topic to think about, and quite honestly it can be a very conflicting thing to decide. Collector's editions are very expensive. This is especially true now a days. I remember in 2013 when I bought Tomb Raider for the Xbox 360, the collector's edition was only 70$. Yes, I'm sure you think I'm crazy for saying that 80$ as a college student is not a lot, but hear me out. 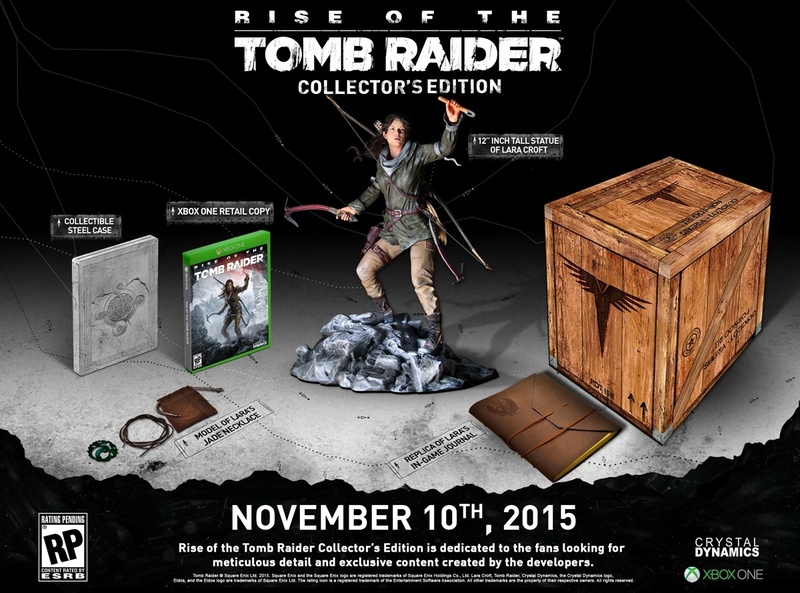 The price for The Rise of Tomb Raiders Collector's Edition is a huge 150$. This has almost doubled in price! So this blog is to talk about if it's really worth it. Now if you're like me and are a die hard fan for a series, sometimes it's hard to say no to a collectors edition. Something that only gets you an art book and some new outfits might not be worth the extra 20 or 30 dollars that they are putting it for. My suggestion is to look at the content. (For this entire blog I'm going to be comparing it to The Rise of Tomb Raiders Collectors Edition) For example, if you get a statue or a figure from the game you really have to think about how much this will cost on its own. In TR's box there is a 12" statue of Lara Croft. Something this large usually runs for about 70-100$. This of course depends on what the figure is of. Other things that you usually find included in collectors editions are things like, lithographs, art books, accessories, free DLC, and other things. Now usually lithographs usually run about 20-60$. Art books usually go for 10-25$. Accessories can really vary but can sometimes be really expensive, usually you can expect anywhere from 20-60$. DLC is usually about 2-15$ depending on the content. Now as you can see a collector's edition is well worth the cost. With all that is included you most definitely get your money's worth when buying it. Really the main thing when it comes to deciding if you can get a collector's edition, is your own financial status. Can you really afford 150$ for a game. Another thing to note ask is, do you even have the right console for it. In this case, I do not own an Xbox One so buying this collector's edition, and a console is going to run me about 500$. That's probably when you should start asking, "is it really worth it?" That's all for today guys. Be smart about buying!